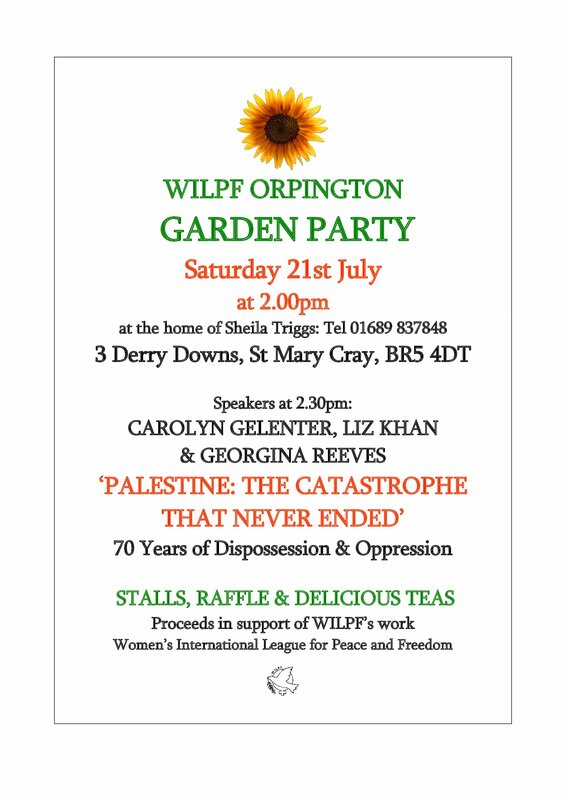 WILPF Orpington’s annual Garden Party will be held on Saturday 21st July 2.00pm, at UK WILPF member Sheila’s home: 3 Derry Downs, St Mary Cray, BR5 4DT. 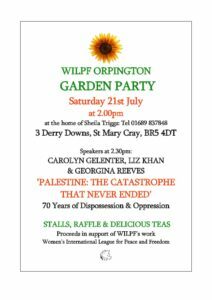 Our speakers will include Carolyn Gelenter, Liz Khan and Georgina Reeves, who will discuss ‘Palestine: The Catastrophe That Never Ended. 70 Years of Dispossession & Oppression’. Books/CDs/ DVDs, Bric-a-Brac, Plants & Preserves and Raffle. Orpington is near to London, with trains taking as little as half an hour to arrive there from Charing Cross, Waterloo East and Victoria stations. There are also regular buses and Orpington branch members will be happy to meet anyone coming from London.